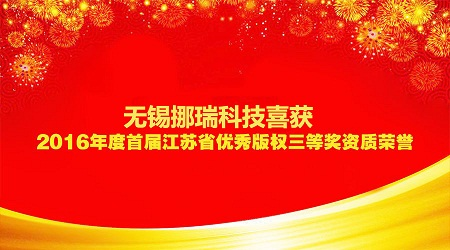 Under the strong support of the company's leaders, under the guidance and care of the leaders of the Huishan District Science and Technology Bureau and the Wuxi City Economic and Information Committee, the company's soft asset management was re-transmitted, and the company won the "Jiangsu Province 2016 Excellent Copyright Award (software). Class) Third Prize" honor. This award was first held in Jiangsu Province. NuoRui Technology won the glory honor by winning the competition and winning the championship! The award marks that the soft asset management reward category of our company has achieved a major breakthrough since the establishment of the company. It also has far-reaching strategic significance for the company's intellectual property management and product branding and promotion. Since its inception, NuoRui has been focusing on the development and industrialization of navigation equipment for ocean-going vessels that meet international standards. Its self-developed electronic chart display and information system has passed the certification of China Classification Society, British Classification Society and EU MED, and has been widely used in ocean-going merchant ships, government official ships and offshore vessels, breaking the foreign monopoly. The software obtained software copyright and software product certificates in 2014. It was learned from the Office of the Organizing Committee of the Excellent Works of Jiangsu Province that NuoRui Technology won the third prize of the first excellent copyright works (software category) in Jiangsu Province through fierce competition. Only two companies in Wuxi were selected. The award-winning product won the gold medal of the 19th China International Software Expo in 2015. The award-winning is the affirmation and praise of the company's products by the relevant provincial departments. It also has far-reaching strategic significance for the shaping and promotion of the company's product brand.